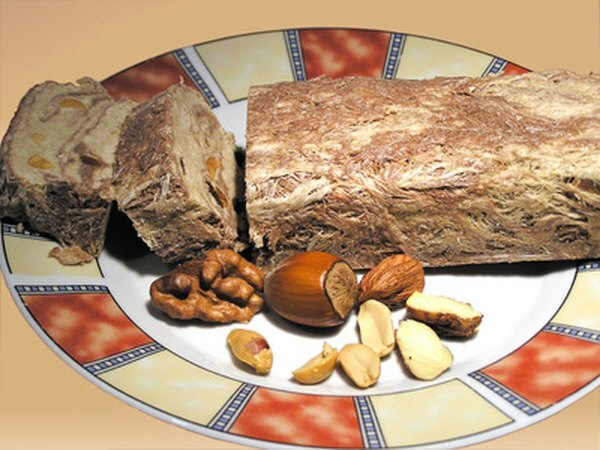 Halva is a generic term that refers to many types of dense confections in the Middle East and surrounding regions. The primary ingredient is flour or some type of nut butter and it also contains one or more sweeteners. The nutritional content of halva depends on the specific recipe, although it’s generally high in fat. Each country and manufacturer has its own type of halva. This nutritional information applies to Attica Greek halva. It primarily contains a paste made from sesame seed paste called tahini. Additional ingredients in Greek halva include honey and cocoa. The serving size is 100 g or about 3.5 oz. A serving of halva contains a total of 478 calories, according to Myfitnesspal.com. Fat provides 279 calories, carbohydrates contribute 163 calories and protein accounts for the remaining 36 calories. This provides 23.9 percent of the daily value for calories, assuming a diet of 2,000 calories per day. Halva has 31 g of fat per serving, consisting of 26 g of saturated fat and 5 g of saturated fat. This provides 47.7 percent of the daily value for fat and 25 percent of the daily value for saturated fat. Halva does not contain trans fat or cholesterol. A serving of halva contains a total of 40 g of carbohydrates, including 4 g of dietary fiber. This represents 13.3 percent of the daily value for total carbohydrates and 16 percent of the daily value for fiber. Halva also contains 9 g of protein or 18 percent of the daily value for protein. Halva contains 3.36 g of calcium per serving or 336 percent of the daily value for calcium. It also has about 11 mg of iron, which is 6 percent of the daily value for iron. Halva contains no vitamin A, vitamin C, potassium or sodium.